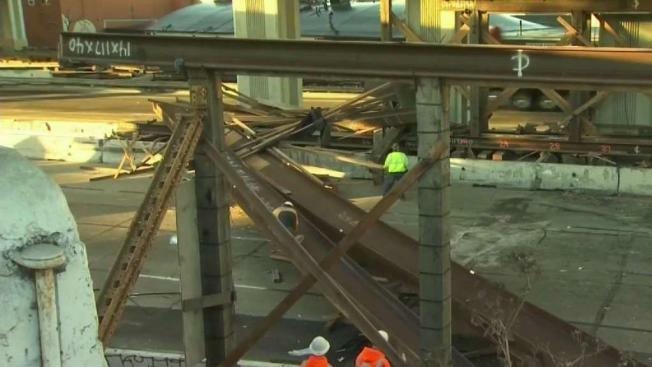 All northbound lanes on Interstate Highway 880 in Oakland were closed following an accident early Friday morning that caused steel beams from an overpass construction to fall. Sergio Quintana reports. UPDATE: CHP says all four lanes on NB I-880 has been reopened. All northbound lanes on Interstate Highway 880 in Oakland were closed following an accident early Friday morning that caused steel beams from an overpass construction to fall. A 28-year-old Hayward woman was allegedly driving at high speed, approximately 80 to 100 mph, and under the influence when she veered off road, up the Jersey barriers and crashed into a supporting beams at the 23rd Avenue overpass, according to California Highway Patrol. The impact caused at least two beams to fall onto the highway, CHP Oakland officer Matthew Hamer said. A Hayward woman crashed into a steel beam supporting the 23rd Ave overpass causing at least two beams to fall onto the highway, the California Highway Patrol said. The woman was transported to a local hospital with non life-threatening injuries, according to Hamer. She was then taken into custody on suspicion of DUI. All four lanes between High Street and 23rd Avenue are closed and there has no estimated time on when the lanes will reopen. Editor's Note: CHP previously estimated that the lanes would be open around 4:00 p.m.